Join us today at 3pm for the Prim Perfect Talk with Draxtor Despres and Jo Yardley, and at 5pm with Cracked Mirror, in the beautiful Prim Perfect Pavilion, designed by Eliza Wierwight of Patron, on Christmas Expo Wonder. 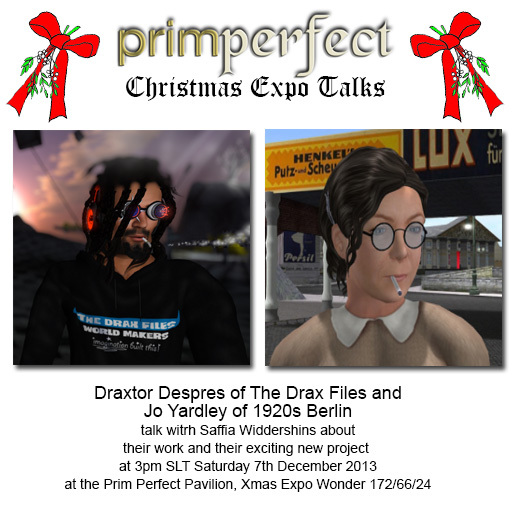 At 3pm pm, Saffia will be talking to Drax about his phenomenally successful series, The Drax Files. and to Jo about her famous recreation of1920s Berlin in Second Life, and to both of them about their new joint project, The Drax Files Podcasts. 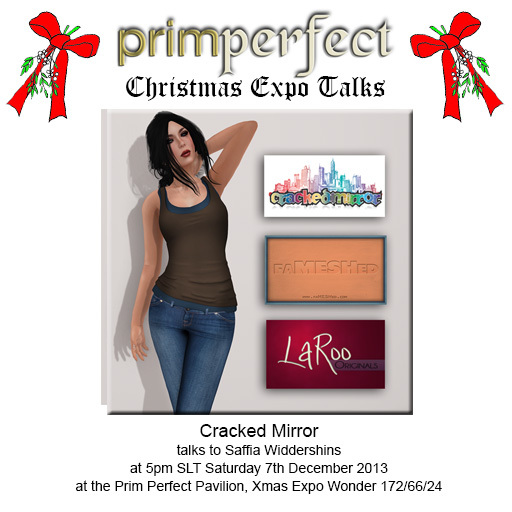 At 5pm she will be talking to Cracked Mirror about her store and the famous FaMeshed event. So do go and vote for your favourites! Previous Post: Blackened Mirror Jigsaw: Running into danger in Episode 2!